Iteca Caspian LLC - WorldFood Azerbaijan - a reliable platform for bringing the food industry specialists together. WorldFood Azerbaijan 2016, one of the most important events in the region’s food industry, will open its doors on 19 May. Over the years, WorldFood Azerbaijan has established itself as a reliable platform for bringing specialists together, presenting equipment, goods, and services for the food industry, finding clients, strengthening existing relationships, and entering new sales markets. WorldFood Azerbaijan is part of the well- known global WorldFood brand, which includes the largest food industry exhibitions in Russia, Ukraine, Kazakhstan, Turkey and other countries. For many years, WorldFood Azerbaijan has been supported by the Ministry of Agriculture of the Republic of Azerbaijan. The exhibition is also supported by the Azerbaijan Export and Investment Promotion Foundation (AZPROMO) and the National Confederation of Entrepreneurs (Employers) Organisations of the Azerbaijan Republic (ASK). This year, the exhibition will feature 126 companies from 23 countries such as Azerbaijan, Belarus, Germany, India, Spain, Italy, Kazakhstan, Lithuania, the UAE, Russia, and the Czech Republic. More than 20 companies from Turkey will exhibit. The Sri Lanka Tea Board will take part and will head Sri Lanka’s group of Ceylon tea producing companies taking part in the exhibition. 25% of exhibitors will be local producers and distributors. Among them will be leading companies in the country’s food sector such as regular exhibitors Azersun Holding, Atena, Caspian Construction Systems, Gilan Holding, and Metak аs well as this year’s newcomers Amoris, Buta Group, and Modern Group. Companies will present their products in the sectors Canned food, Dairy products, Groceries, Confectionary, Drinks, Refrigeration systems, and many others. A distinguishing feature of this year’s exhibition is the wide range of fruit and vegetables being presented on the local market for the first time by Azerbaijani companies. As part of the business programme, the International Standards in Food Safety seminar will take place on 21 May, held by the Azerbaijan Quality Association. WorldFood Azerbaijan will take place alongside Ipack Caspian 2016, the Caspian International Exhibition of Packaging, Tare, Labelling and Printing, which, this year, will offer a much wider range of exhibitors and products. Companies from Azerbaijan, the UAE, Russia, Turkey, and Ukraine will present equipment for packaging manufacturing, marking equipment, packaging materials, tare and finished packaging for various industries. Over a short space of time, visitors can discover offers currently on the market, visit major companies’ stands: both regular exhibitors and new companies on the market, and – most importantly – find goods and services for their business and close contracts with manufacturers and official distributors. The organisers of WorldFood Azerbaijan and Ipack Caspian are Iteca Caspian and its partner ITE Group. 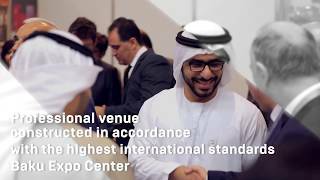 For 8 years, the exhibition has been recognised by UFI (the Global Association of the Exhibition Industry), attesting to the event’s high level of organisation and compliance with international standards. A number of offices from ITE’s network have been involved in the preparation process - ITE London, EUF (Turkey), GIMA (Germany), ITE Gulf (Dubai), and ITE Poland, inviting international companies to exhibit. Official partners of Iteca Caspian’s exhibitions in 2016 are security partner SafeLife, tour operator Premier Tour, official hotels Sheraton hotel and Qafqaz Point Hotel, and official contractor AzExpoMontage. The exhibition will take place from 19-21 May at Baku Expo Centre. For the first two days, the exhibition will be open for industry professionals only, while on 21 May, the exhibition will be open to everyone.